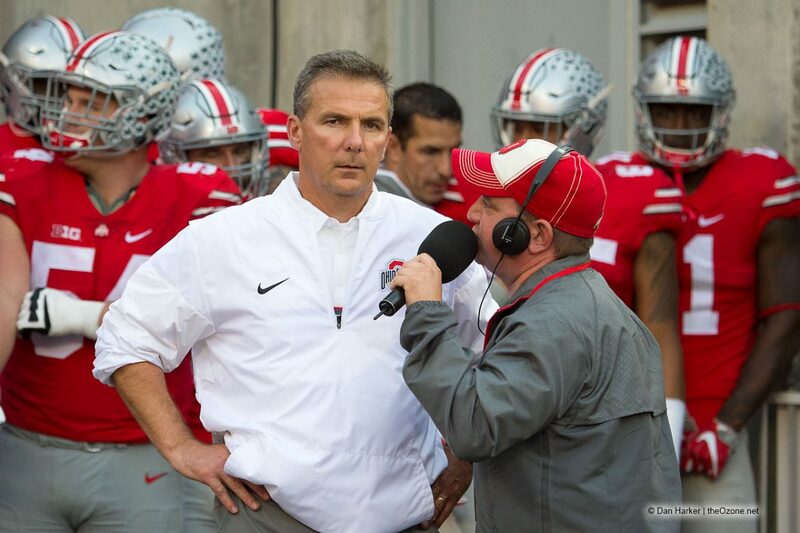 Ohio State head coach Urban Meyer will take part in his weekly radio show today. When the show begins shortly after 12:00 pm, we will provide live updates throughout the hour. Meyer is expected to provide updates on his football team while also answering questions from hosts Jim Lachey and Paul Keels. Meyer will also preview Saturday’s Big Ten Championship Game against Northwestern. Refresh for updates. + OSU will play some zone, which does allow them to make some plays on passes. It also gives the offense pause because they have to know that it won’t always be man coverage. + The Wildcats don’t run a lot of tempo. + It’s a talented offensive group. It starts with the quarterback. He has a big arm and can extend plays in order to throw it. Not a big scrambler for extra yards, but rather extra time. They have to stay in coverage and let the front four get after him. + Wilson told the story of going to Northwestern with former head coach Randy Walker. The first year they had no tight ends or fullbacks, but they didn’t want to throw it as much as Purdue and Joe Tiller did. So they looked at what Rich Rodriguez was doing. Wilson owes so much success to Walker and made him look like a better coach than he was. + The threat of Dwayne Haskins running has helped, but they try to be smart about the risk and reward. Haskins runs into Wilson every day before practice playfully, but he’s bigger than you think. Early in the year they tried to protect him because they didn’t have a lot of depth at the position. + The tight ends have gotten better. It’s a day-to-day practice. Luke Farrell did a great job in pass blocking and completed the offensive line. + Northwestern has won 15 of 16 Big Ten games. Defensively, they aren’t as aggressive. They make you earn every play. They don’t give up a bunch of big plays. They tackle well. They are tough. + Northwestern has very good linebackers with a well-thought-out scheme. They funnel everything into the linebackers and don’t let you get outside. + JK Dobbins and Mike Weber have been outstanding in pass protection. They are fresh, they’re healthy, and they ran very hard on Saturday. + Malik Harrison continues to get better. He practices well. + How do they coach the guys on defensive penalties? “We tell them don’t do it.” Meyer’s issue is if they see it in practice, then get it fixed. + “We should have a Terry McLaurin segment every week on this radio.” He is as good as there is. “There is nothing that Terry McLaurin can’t do.” Meyer is excited to follow his future through football and after football. + Meyer has been fortunate at the H-back position going all the way back to Bowling Green with Robert Redd, then Parris Warren at Utah, then Percy Harvin, then Curtis Samuel, now Parris Campbell. Jaelen Gill is coming up next. Campbell wasn’t heavily recruited, but played so well in the playoffs that they couldn’t ignore him. + The senior receiver captains are some of his favorites. They’ll get jackets, but Meyer wishes it was allowed to give them cars. And the benefit that they will have in the development of young guys like Chris Olave will continue to pay dividends when they are gone. + This is the time of year when you see the payoff from all of the work in the spring and summer. They work to be fresh in this game. + Luke Farrell is turning into a Big Ten tight end. + Dwayne Haskins running the football has helped the offense be more balanced. “You don’t have to be JT, but there’s got to be a threat.” Haskins running the ball keeps the defense honest and slows the defense just enough to help the running backs when they have the ball. + Offensively, Northwestern isn’t great, but they have an efficient quarterback. They do a lot of crossing routes, which hurt the Buckeyes two years ago. Isaiah Bowser is a freshman running back who has stepped up over the last six games or so. + Meyer and Fitzgerald are on the same page with most off-field issues regarding the student-athletes. + Northwestern has very good players and they feed off one another. They don’t have weaknesses. Defense is outstanding. Michigan had a difficult time moving the ball against them. The back of the defense plays so well. OSU has thrived against man coverage, but there won’t be a lot of man coverage in this game, so OSU will have to be patient, which there isn’t a lot of anymore in college football. + The ultimate goal is to win a Big Ten Championship and beat your rival, and it’s been that way for many, many, many years. + Wyatt Davis will start in place of Demetrius Knox. He’s 5-7 pounds lighter and more athletic, but he lacks experience and endurance. Branden Bowen has also been moved to right guard. 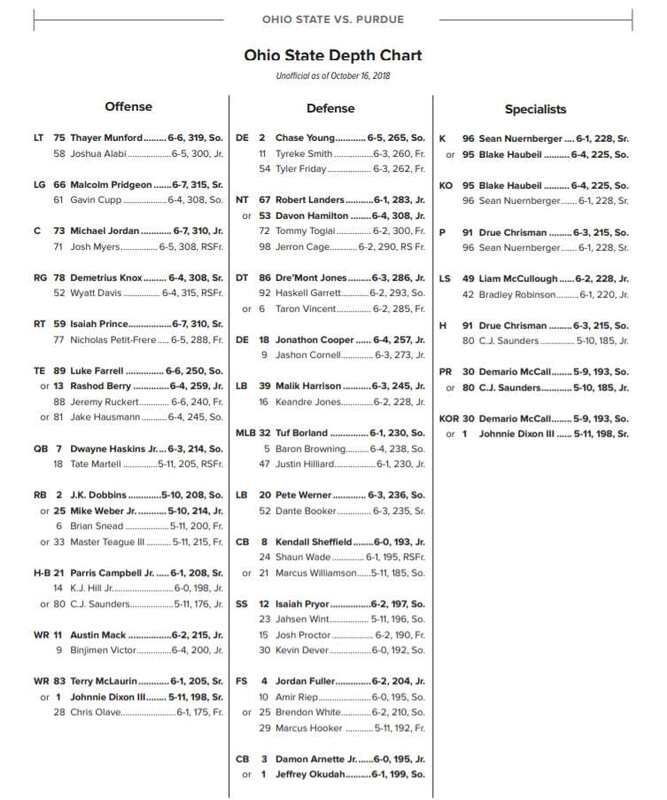 Josh Myers is at center. Bowen would probably be the first lineman in if need be. + Ryan Day went to recruit Chris Olave’s quarterback and somebody said they need to look at Olave. Day and Meyer watched tape of him and fell in love with him. His ball skills are elite and he has Devin Smith speed and ball-tracking skills are up there too. + The key was following through on the “Plan to Win,” which is about field position and special teams execution. The game was a perfect execution of that plan to win. The pass blocking was great as well. + The game changer for the Buckeyes against Michigan was the play of the offensive line. “It’s a hard measure to say that anything was better than the way our offensive line played. The only way we are jumping OK if we both win is by selling the idea that this team has come a long way from the Purdue loss and the defense looks better now than OK. We have to show that we are consistently good on offense no matter the defense being man/zone. Most importantly though, how will the defense look and how many points they give. 10 or less would be ideal. Anything above 20 is probably too much considering NW has not been scoring a lot on anyone. I am hoping for 0. Nice article; As said before, NW offense will be more challenging to our D and NW D may not allow for big plays. But NW has not seen this type of speed or depth. No doubt the OL has improved, but our O seemed to hit excellent mode, once Haskins began running. We can’t underestimate that; 1) D’s now have to keep an eye on him and it opens all else up. 2) It keeps drives alive, instead of 2nd and 16, we’re now 2nd and four. Instead of 2nd and ten, we’re now 2nd and one. Instead of let’s shut down the run or the pass, Haskins, just gouged us for 12 yards and a first down. 3) Our red zone efficiency has gone up as well. No doubt, Olave is a find, but he’s another big puzzle piece that other teams have got to try to manage. You know? For the first time in a VERY long time I think I agree with the coach-hype. Olave does display the possibility of developing into a Devin Smith-type receiver. Agree, we’ve seen his speed, initiation and knack, can he GO UP and GET the CATCH ABLE, DEEP, HARD PASS. So far, Victor hasn’t neither has some others. If he can, watch out! Because all else opens up all the more! Love to see it though. 2014 B1G title, and Play off push anyone? Believe he should get a few cracks in INDY with perfect weather conditions. Indy’s a dome, so yes, the ‘weather’ will be perfect! 😉 I agree, now that the djinni is out of the bottle, give him his shots and see what he does with ’em in Indy and if it DOES prove true that’s where our offense pulls even with Okie’s and our D is head-and-shoulders better. Should be fun!